Follow our recipe or create your own! Exchange the 1/3 cup of Pistachios or Peppermint for your favorite nuts or candy. These also make a great gift for any occasion . Preheat oven to 350°F. Arrange matzos on 2 large baking sheets in a single layer, breaking some in half to fit. In a medium bowl, whisk together buttery spread and sugar and use all of it to brush tops of matzo. Bake, rotating trays halfway through, until sugar is lightly browned, 15 to 20 minutes. Set trays aside to cool completely. 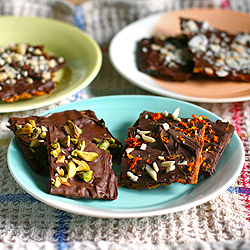 Using a fork, drizzle matzo all over with chocolate and then immediately sprinkle pistachios or peppermints over the top. Briefly chill the trays in the fridge until chocolate is set and then break or cut into 24 pieces. Store in an airtight container at room temperature until ready to serve. Make this easy sweet treat a day or two ahead. After the chocolate has set, simply store the matzo bark in an airtight container at room temperature until ready to serve.